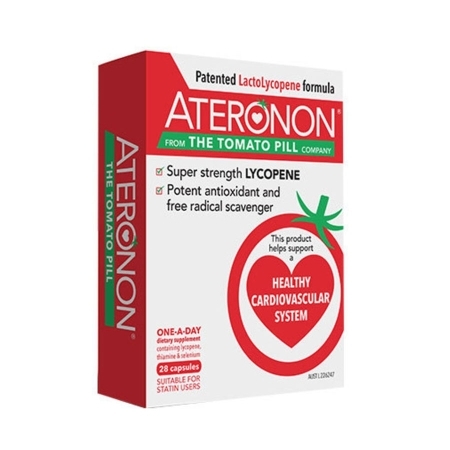 Ateronon is `The Tomato Pill` and is a unique, natural supplement that may help to maintain healthy heart function. It is packed with lycopene, a powerful antioxidant derived from tomatoes that is easy for the body to absorb. The patented LactoLycopene formula, alongside added thiamin and selenium, may help to protect your heart, naturally. Ateronon should be taken once every day with food on an ongoing basis to maintain an effective level of lycopene. If you are taking other medication or you are pregnant or breastfeeding you should speak to your doctor before taking these supplements. It is not suitable for those who are allergic to tomato, whey protein or soy.